Once the active period is completed, your braces are removed. The next step is called retention. Retainers are utilized to hold your teeth in their new positions until your bone, gums, and muscles adapt to the new teeth positions. You must wear your retainer as instructed, otherwise your teeth may shift. If this happens, please contact DeSimone Orthodontics as soon as possible and we will make a plan to return your smile back to its beautiful position! 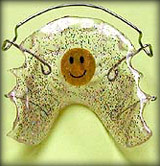 We will give you a schedule for retainer wear. Time varies with each patient. Some people may need retainers for an extended period of time in order to eliminate shifting of the teeth. In some cases, permanent retention may be necessary. The retention period is an important part of your overall treatment and should not be neglected!